The MIT Darwin group puts their work under the microscope at the 2018 Cambridge Science Festival. “In general terms, every other breath you take is generated by phytoplankton—fifty percent of the oxygen [in the atmosphere is produced] by marine life,” says MIT postdoc Jonathan Lauderdale, making their health important to life on Earth. 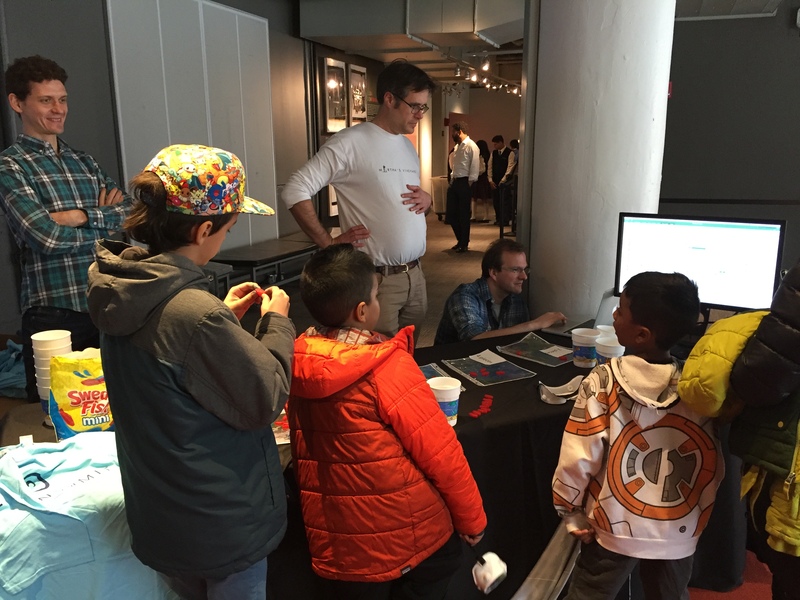 Lauderdale is one of the members of the Darwin Project and the Program in Atmospheres, Oceans and Climate (PAOC) in MIT’s Department of Earth, Atmospheric and Planetary Sciences (EAPS) that presented at the MIT Museum’s Nautical Day during the 2018 Cambridge Science Festival. 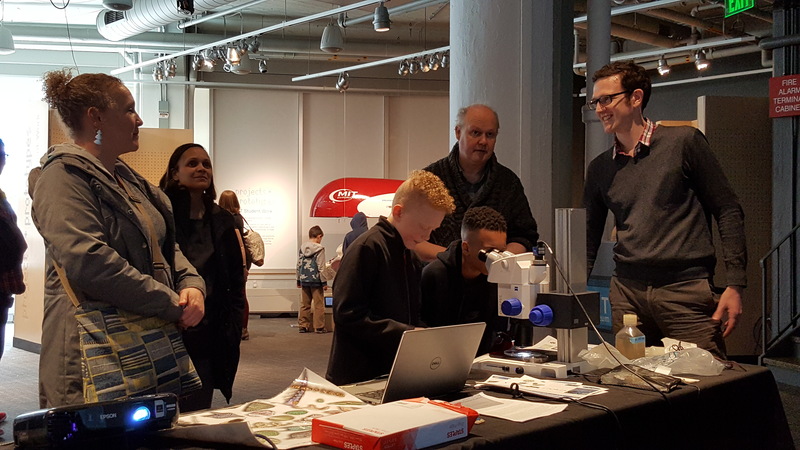 The annual event, in which the group regularly participates, attracts hundreds of guests from the greater Boston area eager to learn more about the latest in oceanographic science, talk with ocean and climate researchers, and join in marine explorations. As members of the Darwin Project, these MIT oceanographers, biogeochemists and marine microbiologists work to advance the development and application of novel models of marine microbes and microbial communities. They identify relationships between individuals, communities and their environment, as well as connect cellular-scale processes to global microbial community structure. As the base of ecological marine systems with controls on the atmosphere and climate, phytoplankton play a major role in their research. 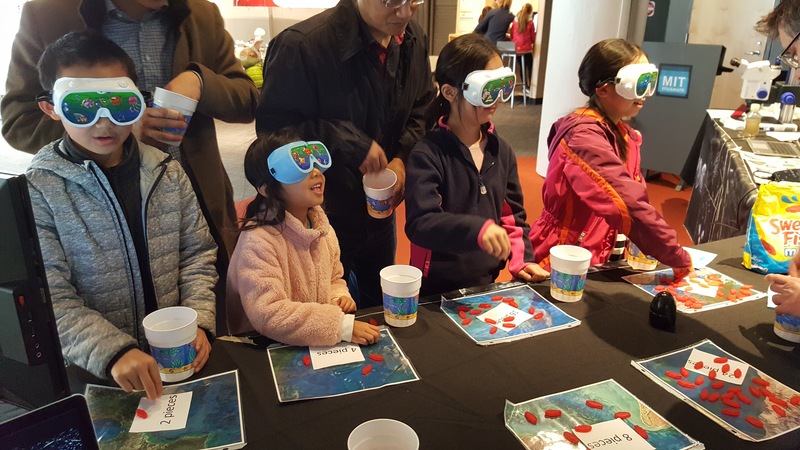 Using a microscope and a simple game, MIT researchers showed Nautical Day guests how ocean modelers turn marine ecological phenomena into mathematical relationships. Graduate students Rebecca Chmiel and Ellen Lalk, postdocs Matt Harke and Ed Doddridge, and Principal Research Engineer Chris Hill examined samples of water taken from the nearby Charles River for diatoms, daphnia, copepods and other marine organisms. They pointed out behaviors and interactions that those species exhibit in their environment. Then, postdocs Jonathan Lauderdale and Daniel Koll, along with Research Scientist Anne Willem (AW) Omta, helped attendees discover connections between food abundance and predator consumption with a popular “bugs to bytes” game, inspired by principles put forth by ecologist Crawford Stanley (Buzz) Holling. Here, blindfolded guests “hunted” for prey at timed intervals by dropping their hand down onto a placemat representing the ocean, hoping to catch a Swedish Fish “prey.” The food level was kept constant throughout the game; some players had more prey on their placemat than others. The researchers then plotted the number of Swedish Fish caught against the number of fish available for hunting. While the raw data generated showed scattering, depending on the individual’s performance, the averaged data fit a curve predicted by Holling. In this way, guests could see how predators with little prey spent most of their time hunting for fish unsuccessfully, while those with an overwhelming amount of prey had plenty but were limited by how fast they could be consumed.